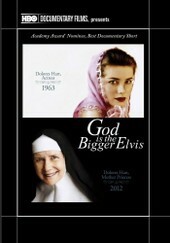 This documentary tells the remarkable story of Dolores Hart, a rising Hollywood starlet who appeared in ten films starting in 1957, acting with the likes of Elvis Presley, Montgomery Clift, and Anthony Quinn, but abandoned her blossoming career -- and cut off her to a young architect - to become a Benedictine nun in 1963. Now Mother Prioress of the cloistered Abbey of Regina Laudis in Bethlehem, CT, Dolores reveals details about her enclosed Benedictine monastery. In addition to footage and interviews shot in the buildings and grounds of the Abbey, the documentary includes archival footage and photos from Dolores Hart's movies, as well as intriguing backstories of some of the other nuns who joined her in taking their vows at Regina Laudis.